The “I” doesn’t stand for invisible. LGBTQI+ is the acronym for the expansive community we call Trans and Queer, but the “I” is rarely talked about. I stands for Intersex, and GSA Network believes that GSA clubs need to be aware and supportive of ALL issues that impact our community. 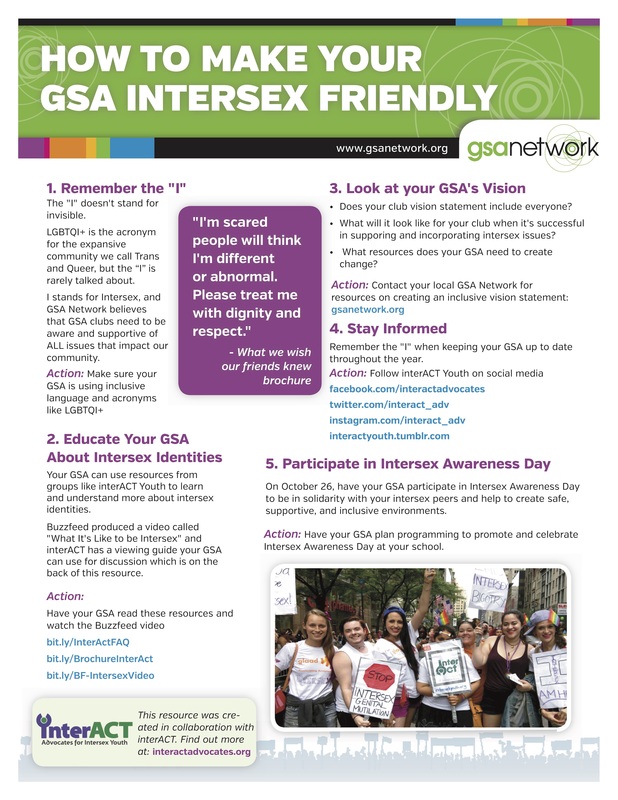 Your GSA can use resources from groups like interACT Youth to learn and understand more about intersex identities. Buzzfeed produced a video called “What It’s Like to be Intersex” and interACT has a viewing guide your GSA can use for discussion which is on the back of this resource. Does your club vision statement include everyone? What will it look like for your club when it’s successful in supporting and incorporating intersex issues? What resources does your GSA need to create change? Remember the “I” when keeping your GSA up to date throughout the year. On October 26, have your GSA participate in Intersex Awareness Day to be in solidarity with your intersex peers and help to create safe, supportive, and inclusive environments. Action: Have your GSA plan programming to promote and celebrate Intersex Awareness Day at your school.